Ask fellow campers about "Madison Campground (Concessionaire Operated)" and nearby attractions. Madison is a good location to base out of for seeing many of the thermal features of the park, including Old Faithful. This campground is set in a pretty lodgepole pine forest near the Madison River (trails lead down to its banks). The campground has no hook-ups but does have a dump station, water spigots, bathrooms with flush toilets (no showers), and dishwashing sinks. Each site has a picnic table and fire ring. Levelness of sites can vary, so come prepared with a good assortment of leveling blocks. Generators are allowed form 8:00 AM to 8:00 PM. We camped at Madison Campground (Concessionaire Operated) in a Travel Trailer. Plan ahead and reserve early. Even in mid-Sept the campground was full. Expect crowds and delays wherever you go. There's much to see in Yellowstone, but you'll be seeing it with a lot of other folks. It's only about 15 miles to the town of West Yellowstone where you can find all services. We stayed 3 nights in the Madison Campground, space E176. Site was pretty level and had no hookups. There was also no OTA channels and little cell coverage. This is a great campground for a Yellowstone Home Base. We were ~30 minutes from Old Faithful, Norris Geyser Basin and the city of West Yellowstone. We ended up renting a car at the W Yellowstone Aiprot so we could just leave our Motorhome set up the entire time. There is also a nice hike right out of the Campground along the Madison River where you can enjoy some wildlife and watch Fly Fishermen. Dogs are only allowed on the pavement - not a problem as it is a huge campground with plenty of loops to walk around. Convenient Dish Washing stations are provided at the restrooms that help keep down on water use in the RV. We camped at Madison Campground (Concessionaire Operated) in a Motorhome. We shouldn't have been given the site we got, even after calling for reservations and giving information (we have a 27 ft. travel trailer with 2 slides) we were assigned a site which was very difficult to fit into. Site was also extremely unlevel. Staff were not friendly, camp host was more worried about making sure every tire was on the blacktop than providing information to guests. No cell coverage, emergency phones were provided. Close to Geysers, hot springs and many park attractions. We camped at Madison Campground (Concessionaire Operated) in a Travel Trailer. Nice little campground, but obviously designed at a time when smaller rigs were the norm. Senior pass gives 50 percent discount. Very busy, all sites full each of 4 nights we were there. Our site was a pull off "elbow". Had to maneuver around trees on drivers side and position slide outs so they could come out around trees. Had two trees approx 6 inches from front driver side slide. A full wall slide would not have worked. Needed leveling blocks on downhill, curbside. That said, it was a nice spot at the end of the loop and we had quite a bit of outdoor space with some shade. No cell service or hookups. Generators can run 8a to 8p and we needed the AC during the day. No showers in the campground. Not pet friendly, they are not allowed anywhere but along roadsides and at your site. It was mostly quiet. We camped at Madison Campground (Concessionaire Operated) in a Motorhome. The national park was extremely busy. Most points of interest required a 15-20 minute wait to get a parking spot. Traffic was very heavy. Construction between Mammoth Hot Springs and Norris lead to delays. Madison Campground is managed by Xanterra, the park concessionaire and has all reservation sites that tend to fill up months in advance. There are typically cancellations every day, so even if the sign says "full" it is worth stopping by the office. It is a very large campground with about 10 loops, some of which are tents only. Sites are close together but the setting is nice and the views can be quite good. There are some roadside pull-throughs that can accommodate large RVs, so don't take the web site's limitation to 40-feet combined tow+RV to be strictly applied. The location is great for the geyser basins and the Madison River area. Closest cell service is at least 7 miles away. We camped at Madison Campground (Concessionaire Operated) in a Fifth Wheel. Cell reception at the seven-mile bridge on the way to West Yellowstone. We stayed here May 30 and 31, having made reservations only two days before. We were at another campground in Yellowstone and wanted something in a different area. So we stopped here in our tow vehicle while touring around. It is dry camping, generator hours which we used for 10 mins in the morning for coffee and the same in the evening. Very quiet campground for the number of sites and seemed like only a handful of people used generators for a short period of time. Our site E187 accommodated our 31ft RV and tow, tho some leveling was required but not bad. We had trees and far enough from neighbors to have some privacy. A short walk brought us to a river and a field full of bison early morning. This was a good campground in my opinion, restrooms were average, didn't use showers. Location was excellent. Would definitely return. We camped at Madison Campground (Concessionaire Operated) in a Motorhome. Lots of improvements in the past few years.... Fairly clean, and an incredibly noisy gen set that ran all day.... A lot of people applauded when they shut it down at 8pm... Elk in camp, and a very large bull bison... nights were quiet. 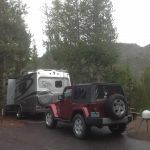 This was not our first visit to Yellowstone, and hope to be back again... We camped at Madison Campground (Concessionaire Operated) in a Truck Camper. We camped three nights at Madison Campground during our 11 day Yellowstone visit. This is a great location to explore the Park. There is much to see and do both north and south of Madison junction. Next time we will stay at least one more day on this side of the park. There are no hookups and no showers here, but there is a dump station with water and generators are allowed from 8 am until 8 pm. Most RV's use their generators 1 or 2 hours in the morning or at night. The remainder of the time is quiet. 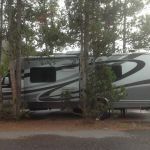 (Many rental RV's in park without generators.) The weather was cool enough that we did not need our A/C and ran our furnace at night. Campsites are fairly level, but many are tight. It was necessary to park our motorhome at the precise spot between the trees for our slide out. There was a picnic table and fire ring. Bathrooms are clean and conveniently located. We camped at Madison Campground (Concessionaire Operated) in a Motorhome. About 16 miles from Old Faithful, Madison is a good location to stay at while visiting Yellowstone. No water or electricity, this is dry camping in a nice wooded environment. Generators from 8-8. They gave us a "C" loop campsite that is sometimes hard to maneuver. Showers available at Old Faithful for 4.25. No cell service. Might look at something different next time. We camped at Madison Campground (Concessionaire Operated) in a Travel Trailer. Large Campground with no hookups inside of Yellowstone National Park. Sites are very tight on the parking spur portion. We got a pull thru that was supposed to be for a 37' 5th Wheel and Pickup, and could not possibly drive through it because it was too sharp of a turn with trees in the middle. We were able to make it work by backing in to it. The dirt portion of the campsite with the fire ring and picnic table was very spacious though. This campground was not designed for very large campers unfortunately. The surrounding ground was all dirt, fortunately for us it did not rain or it would have likely been very muddy. All in all I would call the campground average at best. There were ranger discussions each night at the amphiteater adjacent to the campground which was nice. Boxes of wood were 8 dollars. There were a lot of fires in the park during our visit. The campground was full or almost full every night. We camped at Madison Campground (Concessionaire Operated) in a Fifth Wheel. Ranger Led discussions each night at 9pm at the amphitheater. We stayed here for a couple of days on our way to Glacier National Park in MT, and loved it. The grounds were nice/well shaded and the staff helpful. I would recommend this park to anyone traveling through Yellowstone. We camped at Madison Campground (Concessionaire Operated) in a Motorhome. Quiet campground, well shaded. Campground host was in the loop. Some threat of bears, meaning any food needed to be in a hard-sided camper or vehicle, and rangers walked through to monitor compliance regularly. As with most national park campgrounds, there is no water or power at these sites, and generators are allowed during certain hours. We camped at Madison Campground (Concessionaire Operated) in a Travel Trailer. Always remember this is a big park and may take a few hours to drive from one side to another, in good conditions. If someone sees what looks like a bear, expect a traffic jam. There are tour groups that may not speak English, so keep an eye out for that. Most stores we found were centered around Old Faithful, just plan to move around to find the areas that are not crowded. See Old Faithful & Mammoth Hot Springs, just leave plenty of time in your schedule, and stay on the boardwalk. Wonderful park with very helpful staff. Clean campground. Abundant wildlife. Just s great place. We camped at Madison Campground (Concessionaire Operated) in a Motorhome. We stayed here for 2 nights in May 2016. This campgrounds is very nice and great surroundings. Mostly pine forest with plenty of space between neighbors. Fire rings are available and you are close to many of the natural attractions. Staff was very helpful and nice. We camped at Madison Campground (Concessionaire Operated) in a Travel Trailer. 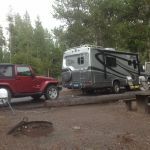 Large campgrounds with lodgepole pines throughout. Roads & sites are asphalt. Table, bar bq & fire pit at every site. Heated clean bathrooms but no showers. Dump station. No cell service. Great location to visit all parts of Yellowstone. We camped at Madison Campground (Concessionaire Operated) in a Travel Trailer. Check where to go in case of trouble. No hosts in campground, no cell service. Good wi fi and cell service at visitors centers. Are you affiliated with Madison Campground (Concessionaire Operated) ?